San Antonio Spurs coach Gregg Popovich was named NBA coach of the year on Tuesday, making him just the third coach in league history to win the Red Auerbach trophy three times in his career. Popovich has received the league’s top coaching honor in two of the last three seasons, joining Don Nelson and Pat Riley as the only coaches to win the award three times. In a career full of masterful coaching performances, Popovich may have delivered his best in season No. 18. The Spurs entered the season still thinking about the devastating loss to the Miami Heat in last summer’s classic NBA Finals. Once again thought to be too old to challenge LeBron James and the mighty Heat, the Spurs took the defending champions to seven games but couldn’t quite close it out for the franchise’s fifth NBA title. "Suffice to say that I’ve thought about it every day," Popovich said at training camp in October. "I’m wondering if it will go away. I’m anxious for it to happen, but it hasn’t happened yet." They showed up to training camp still stinging from that defeat, and Popovich had to get to know a new-look coaching staff after losing longtime assistants Brett Brown and Mike Budenholzer to head coaching jobs in Philadelphia and Atlanta. Then he led the Spurs to a league-best 62-20 record, which gives them home-court advantage throughout the playoffs. And he did it while deftly navigating a season filled with nagging injuries to several key players. Tim Duncan was the only starter to play in at least 70 games. No Spur averaged 30 minutes per game and Tony Parker led the team with a modest 16.7 points per game. Despite all of that, the Spurs won at least 50 games for the 15th straight season and topped 60 for the fourth time in that span, an unprecedented run of sustained excellence in the modern era. He added free agent Marco Belinelli, juggled the lineup to keep veterans Duncan and Manu Ginobili fresh for the playoffs and used his role players often enough that they enter the postseason brimming with confidence. The Spurs lead the Dallas Mavericks 1-0 in their best-of-seven series, with Game 2 on Wednesday night in San Antonio. "He’s a gentleman," Belinelli said. "Everybody knows that he’s the best coach in the league. So to say that is not really important. But maybe some people, they don’t know he’s really a great guy, a great gentleman. He really helps guys, helps each other. He wants to help everybody. Great person." 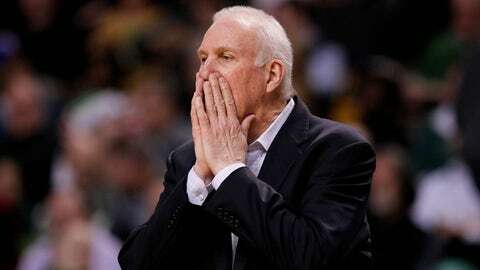 Popovich garnered 59 first-place votes and 380 total points in voting conducted by a panel of media members. Phoenix’s Jeff Hornacek (37 first-place votes) finished second and Chicago’s Tom Thibodeau (12) finished third in the voting, with Charlotte’s Steve Clifford and Toronto’s Dwane Casey rounding out the top five in a season so strong that Miami’s Erik Spoelstra did not make the top 10. "I think he should be the coach of the year this year," Minnesota coach Rick Adelman said of Popovich at the end of the season. "You talk about everybody else, but coming back off of a Finals loss and what he’s got them to do, with injuries too, he should be considered. He probably says he won’t want it, but I think he’s done a great job. He’s been able to keep his system going."